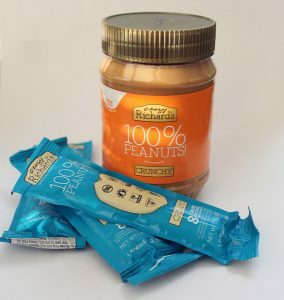 Crazy Richard’s offers a peanut butter made from 100 percent peanuts. Photograph by Bob Rozycki. To everyone who vowed to eat healthier in the new year – how’s that going? If your resolve has faded, we’ve just come across a product that might make your commitment snap back into shape. Crazy Richard’s is an Ohio-based brand of peanut butter. What makes is stand out is its ingredient list – and that consists of one thing, peanuts. The product is billed as being made from “100% high-quality nuts and nothing else,” and is known for its creamy, “clutter-free” nut butter made without the usual oil, sugar and salt. The product comes in jars and single-serve pouches. The brand also offers almond butter, cashew butter and peanut butter powder. To note, Crazy Richard’s donates 10 percent of profits to causes that promote children’s wellness. It’s available in Stop & Shop and ShopRite, as well as online.